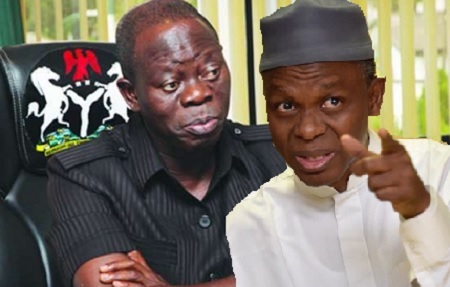 The National Chairman of the ruling All Progressives Congress (APC), Adams Oshiomole and Kaduna state Governor, Malam Nasir El-Rufai have launched verbal attack on the presidential candidate of the People’s Democratic Party (PDP), Atiku Abubakar over his United State trip which got many excited. 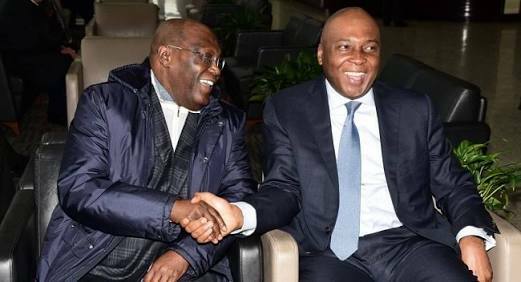 The duo who spoke in Kaduna on Friday, as the presidential campaign train of the APC hit Kaduna, say Atiku should come and explain to Nigerians why he couldn’t go to America for 12 years, rather than celebrating American visa as if it was a great achievement. The party chairman said, “the fundamental issues of the campaign were the pronouncements by the PDP presidential candidate to sell the NNPC just as they sold out NITEL, NEPA, Nigerian Airways and other government agencies saying that the people should resist that move by not voting for them. “It was under the watch of Atiku as Vice President that all the textile and other factories in Kaduna closed down. He has even said that, if he is elected, he will sell NNPC refineries. “That is why he has travelled to where he will negotiate for the sale of our assets. He has gone to assure them that, if he elected as Nigerian President, he will sell all our assets to them. He thinks Nigerians are stupid, but we are not,” he said. On his part, Governor Nasir El-Rufai said, “Your excellency, while you were in Delta State, Atiku Abubakar went to the United State to report to his masters, those that are controlling him. He is in America, after begging for visa for 12 years. “But it is disturbing that, people in the PDP are celebrating instead of crying. So, all of a sudden, going to America is now an achievement. Mr. President, I first went to America when I was 22 years old. So, it is not an achievement. “Nigerians will not vote those who will take their money to America. Nigerians will not vote those who will go to America to seek Trump’s blessing before they will come and contest in Nigeria. Reacting, Atiku said the APC and the Presidency have entered panic mode and should be ignored as they are running out of ideas and excuses for their failures since 2015. He said Nigerians now have a choice to vote him next month and experience true development in all sectors.